Finely chopped Onion - 1 no. Take all the ingredients together and make a tight dough and keep aside. Now for stuffing add all the ingredients together and mix it well. 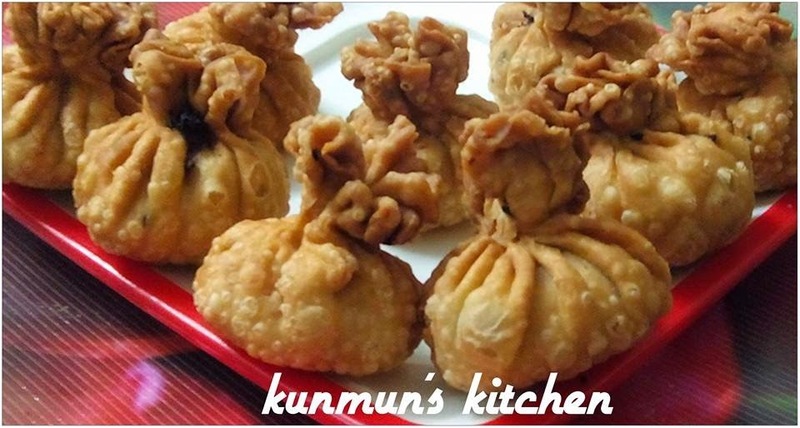 Now divide the dough into equal balls and roll it like Pooris by a rolling pin. Put 1 tsp filling in the middle and cover it from all sides tightly and make potlis (give any shapes as your choice). Heat oil in a frying pan and deep fry it in low-medium flame. Remove from oil and soak in tissue paper. Serve this with any chutney or ketch-up. Enjoy it !!! and i can name a million others and i am proud to say our greateness can be exerted beyond our national borders. we are the fifth largest speakers! its the only country in the world which took rebellion because it couldn't speak its mother tongue and it won! and won so hard that the UN had to adopt that day as the international language day, which celebrates languages from all over the world. did you know that the FAMOUS SEARS TOWER is architectured by another bengali?"